Hard to believe, but the holiday season is just around the corner once again! Celebrate the beginning of the holidays, and help a Golden Retriever rescue raise funds to help its dogs. 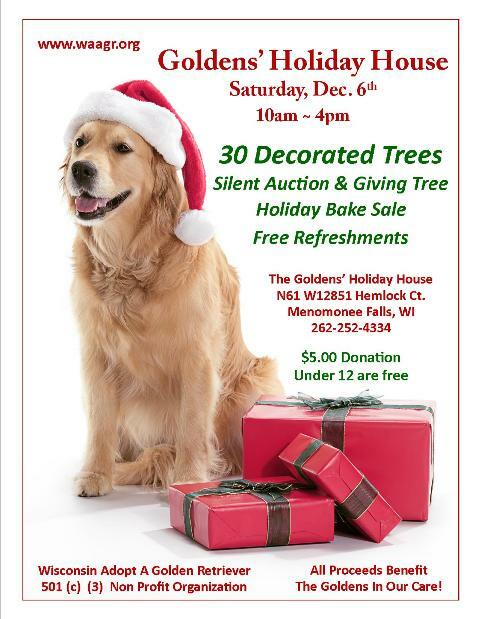 Wisconsin Adopt A Golden Retriever (WAAGR) will hold its 11th annual Goldens Holiday House on Saturday, Dec. 6, from 10 a.m. to 4 p.m. WAAGR, an all-volunteer/member Golden Retriever rescue organization, will host the event at the home of one of WAAGR’s founding members, N61 W12851 Hemlock Court, in the River Heights South subdivision, Menomonee Falls, Wis. The home will be decorated with 30 trees, including a Wizard of Oz tree, a snowman tree, and a tree dedicated to Jolly Old St. Nick himself. WAAGR Board member Barb Hart, who hosts the event with her husband Jim, begins decorating her home for the event in October. This year’s event also will feature a baked goods sale, silent auction, complimentary refreshments, and plenty of Golden Retrievers to greet attendees. A $5 donation is requested to attend the Goldens’ Holiday House, with kids under 12 admitted for free. All proceeds from the event go to help the Goldens in WAAGR’s care that are awaiting new homes. So far in 2014, WAAGR has helped 60 dogs. The tallest tree decorated for the event is 12 feet, the shortest is two feet tall. Barb Hart said she has collected more than 2,000 Hallmark ornaments in 35 years, which adorn all but one of the trees. Wisconsin Adopt A Golden Retriever received its 501(c)(3) February 2005 and helped its first dogs in May of that year. WAAGR’s mission is “to provide bright new beginnings to displaced Golden Retrievers.” WAAGR is an all-volunteer/member rescue organization based in southeastern Wisconsin, also serving the Madison area and the Fox Cities/Green Bay areas. For more information about WAAGR and adoption, visit www.waagr.org.